Doncaster manager Darren Ferguson greets Posh boss Grant McCann before the game. Photo: Joe Dent/theposh.com. Peterborough United manager Grant McCann praised ‘a top-class’ defensive display after his side fought out a 0-0 draw at Doncaster Rovers today (September 2). 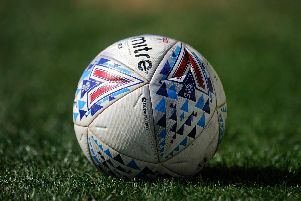 Posh failed to win for the first time in League One after delivering a display which lacked its normal attacking spark. Marcus Maddison is on the attack for Posh at Doncaster. Photo: Joe Dent/theposh.com. But McCann was happy enough with a point as Posh stayed top of the table, on goal difference from Shrewsbury Town. It was a first League One clean sheet of the season for McCann’s men. He was also thrilled by the backing his team received from almost 1,700 travelling fans. “That was a very competitive League One match against a side who are good at home,” McCann stated. “We lacked our usual attacking spark, but I was pleased we were able to show a different side to our game. We were top class defensively. We were resilient and resolute and I can’t remember our goalkeeper having a dificult save to make. “We created the better chances in the first half, but we found it more difficult in the second half. They paid us respect by matching our formation. “I will get back on the bus happy with an away point, but the disappointment among my players in the dressing room shows how high our standards now are. “We are still unbeaten and we are still top of the league. We have to be happy with that. Rovers’ former Posh boss Darren Ferguson said: “I enjoyed the game. It was a real tactical battle. “Grant McCann has a very good side. It’s too early to say if they are favourites for promotion, but they have started well and they have great confidence.